You guys are funny. Thanks for posting the photos. Growing up in So. Cal. 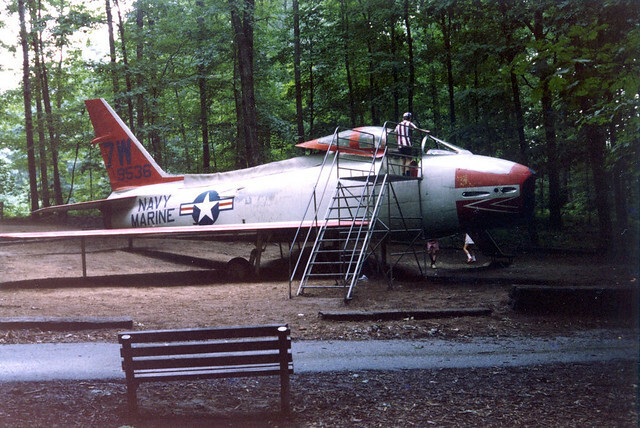 and traveling (virtually) every summer up to the Mammoth Lakes/June Lake Loop area for summer vacations, I recall there being an A-4 Skyhawk at a park in (I believe it was) Lone Pine. I think it was at the north end of town. I haven't seen it there for years, and can't even find mention of it on google. Does anybody here remember that plane, and know what may have happened to it? I remember a jet in a park in one of the towns also, Lone Pine or Independence, on the west side of the road, but I think it was a Cougar. I definitely remember that when driving through as a kid in in the 70s. I recommend posting your playground plane questions on WIX, they have the answer. I often wondered whatever happened to the plane at Cabin John Park. I grew up not far from there and mom frequently took us to the park to play. Like others, I remember being able to crawl through the fuselage, starting at the tail and emerging from the inlet at the nose. I remember in the early 1970s, the cockpit had been gutted of instruments and controls. The cockpit was nothing more than aluminum diamond plate as I recall, allowing a transition from the steps to the slide that came out the other side of the cockpit. I was fascinated by the plane, pretty much because my family had an aviation background. Dad had been a pilot in the Army Air Corps before beginning his commercial career with Capitol Airlines. Mom was a flight attendant. Both continued to fly after Brand X was acquired by United. Mom stopped flying after she had us, but Dad stayed on until reaching mandatory retirement. I can recall almost getting stuck in the airframe at Cabin John once. I had been crawling through with my arms ahead of me. Midway through, I tried to pull my arms all the way under but ran out of room, even though I was a skinny kid. Are there any pictures of the plane that was at Cabin John? As I ask this, I think Mom may still have some old slides from that era. I apparently have a lead on where the parts of the Wheaton F7U ended up. Stay tuned! Thank you Saxman! That's the one I remember and probably goes a long way toward explaining how I ended up in Aircraft Maintenance for the Marine Corps. Update: The rumors of the F7U being buried were exaggerated. I met up with the Deputy Parks Director on an unrelated topic, and we started talking about airplanes. I told him the story about the F7U and he shook his head. 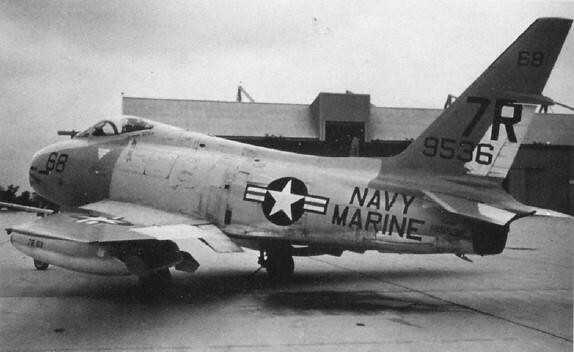 The plane was scrapped, although some parts may have been used for a static F7U restoration.